It’s Follow-Up Friday: Rube Slowberg Edition! And in today’s post, I’m returning to the subject of Rube Goldberg machines. A Rube Goldberg machine, you may recall, is a device designed to accomplish a simple task in as many unnecessary, ludicrous steps as possible. 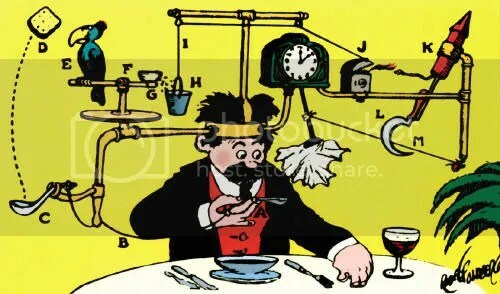 The name comes, appropriately enough, from Rube Goldberg, a cartoonist and inventor most famous for his cartoons featuring singularly silly and elaborate machines like the one pictured above. We’ve posted videos of Rube Goldberg machines in the past, because they’re a perfect example of a mechanical puzzle in action. Only when things happen in a precise order does the machine complete its task. There are numerous competitions pitting clever puzzlers and inventors against each other to build the most spectacular and labyrinthine Rube Goldberg device, but Bob Partington has taken the concept to an unexpected extreme. You see, he’s designed the world’s slowest Rube Goldberg device. The goal is simple: put the golf ball into the hole. But it takes WEEKS to perform! When Goldberg started doing his drawings, even he couldn’t have envisioned someone taking his hilariously elaborate ideas this far. Kudos to Bob Partington for taking the waiting game to the next level. Watching this in real time would be like Zen and the Art of Rube Goldberg Machine Maintenance. This entry was posted in Games, PuzzleNation, Puzzles and tagged Bob Partington, DIY puzzling, Field Day, Follow-Up Friday, games, Geeking Out, grass, molasses, patience, Pop culture, PuzzleNation, Puzzlin' fool, Rube Goldberg, video, World's Slowest by gmdirect. Bookmark the permalink.